Title: "Welcome to Patong Beach"
The bay at Patong Beach in Phuket, Thailand may well be one of the most beautiful beaches in the world. It certainly looked like it when we arrived at the dock by boat one morning in 2017. The bay boasts pristine azure waters and a magnificent sweeping arc of a sand beach stretching in both directions as far as the eye can see. As always, I’m on the lookout for interesting and unique backgrounds for future paintings. And after a pleasant walk up the beach road, Patong Beach didn’t disappoint. The intersection of Thawewong Rd (the beach road) and Thanon Banga features an improbable yet remarkable and audacious welcome sign that I just couldn’t resist. Thanon Banga is a one way street that is closed off to traffic at night and that’s a good thing because I haven’t been anywhere in the world that has more bars and nightclubs per foot than this party street. But at 11 in the morning, all is quiet and laid back. 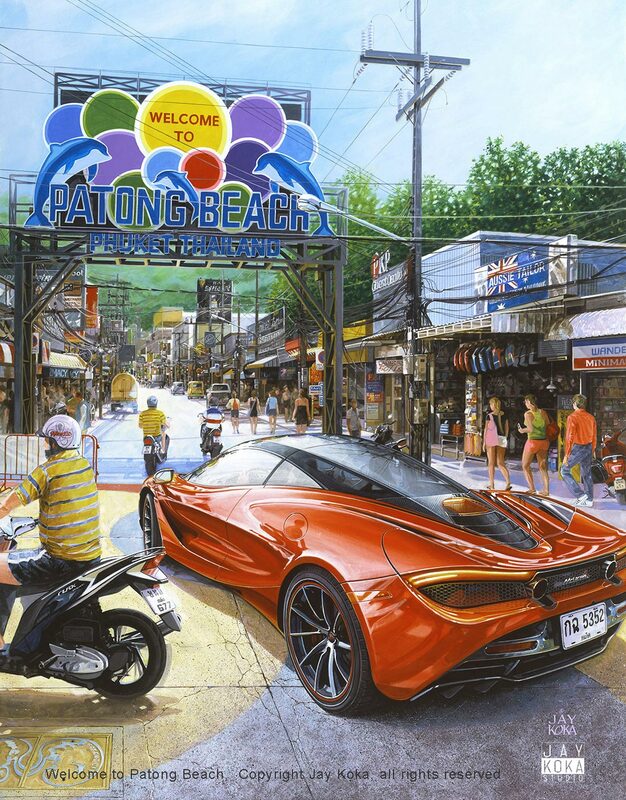 Taking advantage of a lull in traffic and an empty road, a McLaren 720S makes its way up party central avenue… A very large but finely detailed and rendered acrylic on canvas original. Scheduled to premier at the AFAS Exhibition at the 2018 Pebble Beach Concours d’Elegance, the original painting is in a private collection.